Disney XD's animated Big Hero 6: The Series is set to launch Monday, November 20 (8:00-9:00 p.m. EST), with a one-hour primetime television movie, Baymax Returns, simultaneously on Disney XD and Disney Channel, and available on the DisneyNOW app and Disney XD VOD. Immediately following the TV movie, two special full-length preview episodes of Big Hero 6 The Series will debut exclusively on the DisneyNOW app and Disney XD VOD. "Pocket Baymax," a customizable, interactive virtual assistant which brings Baymax to life, launches on DisneyNOW that same day. Set in the fictional city of San Fransokyo, Baymax Returns explores the moment in Walt Disney Animation Studios' Academy Award-winning feature film after Hiro believes that his compassionate, cutting-edge robot Baymax is lost in the portal forever and discovers the chip his brother Tadashi designed to create Baymax. 14-year-old tech genius Hiro begins school as the new prodigy at San Fransokyo Institute of Technology and sets off to rebuild Baymax, but his overconfidence and penchant for taking shortcuts leads him and the newly minted Big Hero 6 team, Wasabi, Honey Lemon, Go Go and Fred, into trouble. The series, which will debut in early 2018 on Disney XD, continues the adventures and friendship of Hiro, Baymax and the Big Hero 6 team, picking up immediately following the events of the feature film. Beginning Friday, November 24, Big Hero 6 The Series shorts will roll out every Friday for six consecutive weeks on Disney XD, the DisneyNOW app and Disney XD YouTube. The TV movie, series and shorts will roll out through 2018 on Disney XD channels and Disney Channels worldwide. Reprising their roles from the feature film are Maya Rudolph as Aunt Cass, Ryan Potter as Hiro, Scott Adsit as Baymax, Jamie Chung as Go Go, Alan Tudyk as Alistair Krei, Genesis Rodriguez as Honey Lemon, David Shaughnessy as Heathcliff and Marvel Comics legend Stan Lee as Fred's dad. Also joining the main voice cast are Khary Payton as Wasabi and Brooks Wheelan as Fred. Recurring guest voice cast includes Jenifer Lewis as Professor Granville, Haley Tju as Karmi, Andrew Scott as Obake and Andy Richter as Globby. Mark McCorkle, Bob Schooley and Nick Filippi, the team behind the Emmy Award(R)-winning global hit Disney Channel series "Kim Possible," serve as executive producers. Filippi also serves as supervising director. "Big Hero 6 The Series" is a production of Disney Television Animation and carries a TV-Y7 FV parental guideline. From the studio that created Frozen, Tangled and Wreck-It Ralph, the Academy Award-winning Big Hero 6 is the 54th animated feature from Walt Disney Animation Studios. The film was inspired by the Marvel comic created by Man of Action. The action-packed comedy centers on the special bond that develops between an inflatable robot and a young prodigy as they and their close friends seek to solve a mystery that threatens the city of San Fransokyo. Directed by Don Hall and Chris Williams and produced by Roy Conli, Big Hero 6 was released in October 2014 and became the biggest animated film of the year with over $657 million worldwide. In addition to being named Best Animated Picture by the Academy of Motion Picture Arts and Sciences, it was nominated for Golden Globe, Critics Choice and BAFTA awards, and was the recipient of five Visual Effects Society Awards, the most ever for an animated feature, as well as a Cinema Audio Society Award and a Kids' Choice Award for Favorite Animated Movie. 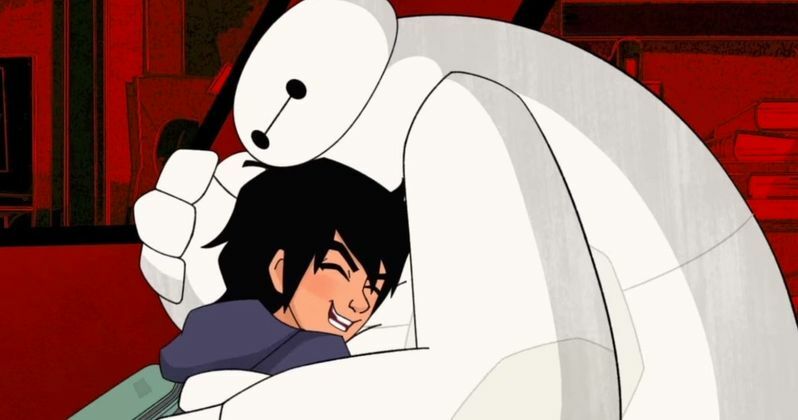 Hopefully we'll get some new footage from Disney XD as we wait for the Big Hero 6: The Series TV movie next mont.